The script can produces reports on the homebase locations of all of your mk3 autotraders (and ESTs) and your stations. Again, the script can produce a report, detailing all the products you produce, and factories that produce them. This can come in the form of a logbook entry, or as a menu. The menu will produce details on factories; for a given product. I tried to have some fun with this, but x3 doesnt like decimals... so its kinda plain. The advanced money transfer stores the last 20 pre-transfer amounts in a list, which is accessable. These values can be written to a report, or two values, selected from a menu, can be compared. 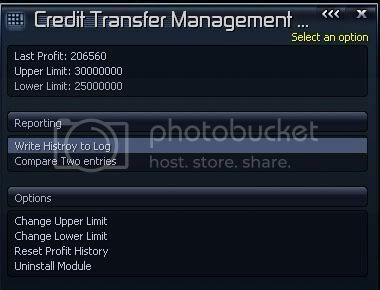 An upper limit is set using the configuration menu, and gradually, the script will assign traders up to this limit. Setting this limit below the amount of traders you already have will cause the script to not hire any more. This script can automatically assign ESTs (providing you have the script installed). This option is also available on the configuration menu. Like the autotrader assignement. This module (yes im comming to that) automatically assigns suitable ships the hq owns to stations that dont own any. If you have CAG installed... the script will automatically assign these. otherwise, you will have to set them up yourself to do whatever. Begin Hq Automation:Start the automation system. Locations Report: Sends a locations report to you. 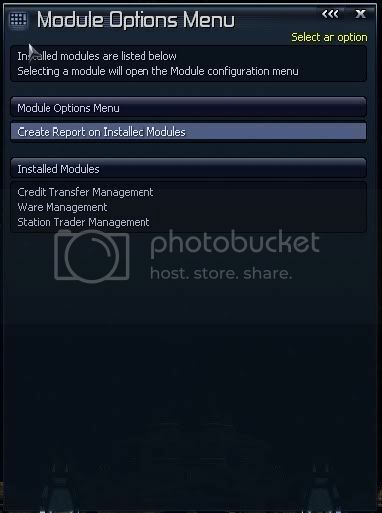 Create Report on Installed Modules: A list of the installed modules and a breif description will be sent to you. Write History to Log: Compare two Entries from the last 20. This will bring up two menus. Select an entry in the first menu and the second and you will get a comparison of the two. Selecting one in the first menu and not the second, will show you the entry you selected. Change Upper Limit: Change the upper limit for HQ funds. Change Lower Limit: Change the lower limit for HQ funds. Setting this to 0 will disable it. If your HQs funds drop below this limit, then it will take money from the player account (if available) to make it up. Reset Profit History: Delete existing entries. This script is designed to have new modules linked to it. This is very easy to do. Any script writers who wish to have a go ~ details on how to do this are in the next post. Ok; This script is finished, and bug free as far as i have tested. I havnt written a readme yet, so if you have any questions, post them here, and i will answer them (or at least try). Last edited by Osiris_sam on Sat, 25. Jul 09, 03:35, edited 6 times in total. Guidelines for Module addon creation: should you wish to make one. This script will run any addon that is hooked onto it. But remember... this script will call your addon periodically. To start with, you need 3 scripts. 006   * Definition of tasks to complete - the various tasks the script can do. 007   * these do not need to be saved as variables, but i find it helps. script name ~ this is how the scripts interact, make sure this line is in there. If you're unsure of any part of this, drop me a pm... im happy to help. Last edited by Osiris_sam on Fri, 17. Jul 09, 19:39, edited 1 time in total. thats pretty cool - i remember this from x3r.. I just got one question - does it work this time? I mean, if I give it my HQ and a sum of money (say, 10 mill), will it be able to stock the HQ for production (will it queue production/repair tasks?) and make a profit through est/ut? You also say that it manages your stations.. So I can plop down stations, and it will 'take care' of them? You say that it transfers money to/from the player, would it be possible to remove the player wallet from this, and instead use the HQ wallet, and request funds from the player if it needs to, through a incoming message? (i see it being like "attention, your headquarter wallet is under the recommended minimum, we need a bailout!" Does it DEFEND itself? Will it defend its factories or transports? If you plop down a station, it will do 2 things. If the HQ has an unused TS (only TS) landed on it, with the HQ set as homebase, it will assign this ship to the station, either as a CAG (if installed). The transfer script could be modified to have another source, a private bank if you will, but i dont see the advantage of this over taking directly from the player ~ either way, the player is gonna have to put money into it. ATM, it doesnt defend itself. or factories, or transports. the way i see it, the trade scripts in existence - apart from the stock ones, have enough warnings (message book, incomming messages, etc...) for you to protect your own ships. Lancefighter wrote: You also say that it manages your stations.. So I can plop down stations, and it will 'take care' of them? 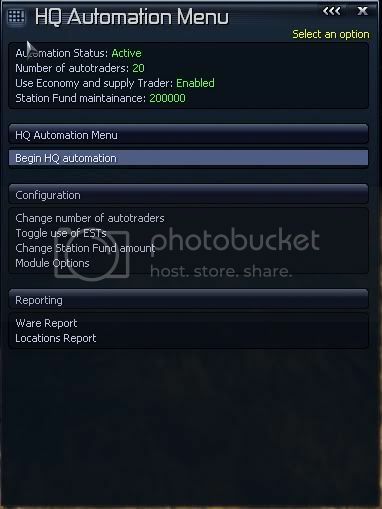 The Station Stock Module will stock newely built stations using a designated trader. This script comes with a custom trader script which will be described in more depth in this post. The trader can be assigned to any station or TL. Setting the homebase to the same station as the one you designate to supply will lock the ship to the station, i.e it will continue to supply that station continuously. Otherwise it will stock it once and then return home. To assign the ship to a tl ( which will unload specified wares from the ship to the homebase) a station homebase must be set. Choosing a TL as the stock target will open a list of wares, and then asks if it should be locked to the task. Last edited by Lancefighter on Thu, 16. Jul 09, 11:38, edited 1 time in total. Please provide feedback, i want to hear what is good or bad about this, bugs or otherwise. How exactly do you get the scrip to work? I've installed it using the SPK, but when I build an HQ in game I can't do anything special with it. once the phq is built and the script is installed, open the hq command console, select a free command slot (as you would to activate any other command). HQ operations: automate should be on the list of available commands. Selecting this, will bring up the menu, from which you start the system and change settings. on the first entry <t id="0"> the number should be 11 ( for version 1.1). Alright, that's the problem, using the cheat plugin, I added a Headquarter to a TL and then built it. When it was built I looked into the command slots to see what I could and nothing about station management was in place. Also, your 1.1 SPK is broken, it's updating something that doesn't have the same name. The version numbers can be different but the package name can't be. a cheated in hq should work just fine (i tested this way). its more likely due to the spk problem. im not sure how that has arisen, i actually just changed the first file :\. ill fix and reupload.